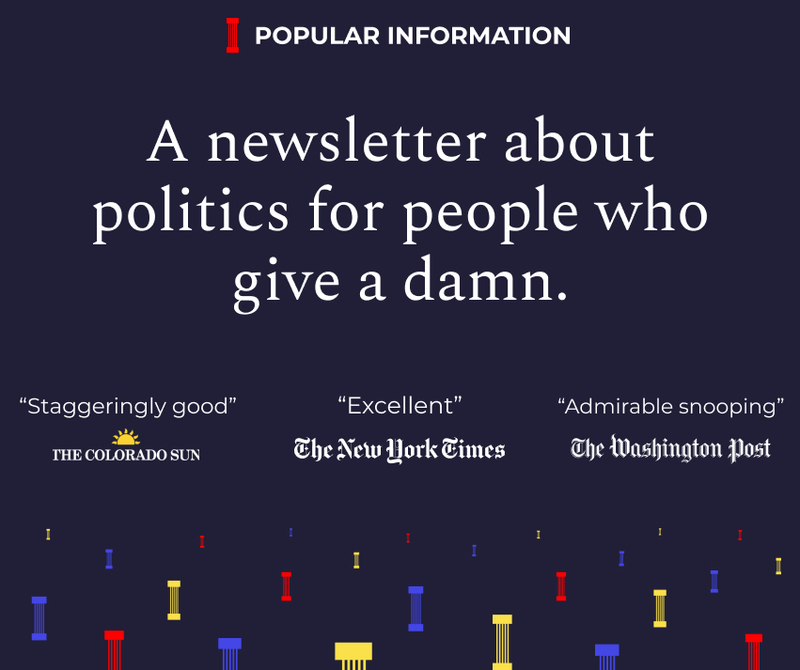 Popular Information publishes Monday through Thursday. I’ll be back in your inbox on Monday, September 17. The Weekly Standard, a right-wing magazine with a long history of pushing false and misleading claims, has been anointed by Facebook as an official fact checker. The designation gives the outlet extraordinary powers to severely limit the distribution of any article on Facebook it deems "false." Facebook approved The Weekly Standard, which had virtually no track record of independent fact-checking, after a pressure campaign from right-wing publishers. I spoke to the independent evaluator who reviewed the Weekly Standard's nascent fact check program to determine if it was qualified. He told me that he concluded that the conservative magazine was not yet ready for the job. After the 2016 presidential election, Facebook had a fake news problem. Reports emerged tracking how Russian operatives and other bad actors had manipulated the Facebook algorithm to push fake news intended to influence the results. It was a very close election, and the unsavory activity on Facebook could very well have been decisive. On December 15, 2016, Facebook announced that it had "started a program to work with third-party fact-checking organizations" to monitor potentially fake news on the platform. When an article is deemed "false" by one of these designated fact-checkers, users are given a warning that the article might be false, plus a link to the fact-check. Further, distribution of the article is reduced by 80%. Facebook announced five partners: Snopes, Factcheck.org, ABC News, PolitiFact, and AP. All of them are non-ideological. The same day Facebook made the announcement, right-wing media outlets complained that organizations like Politifact and ABC News were liberal and the new program was an example of Facebook's bias. Breitbart, a far-right site, complained in December 2016 that the fact checkers selected by Facebook all "have records of left-wing partisanship." The New York Post, the right-wing tabloid owned by Rupert Murdoch, published an article headlined "Facebook under fire for picking ‘liberal’ outlets to fact-check" "Facebook using unreliable liberal fact-checker to fight 'fake news," according to the right-wing Daily Caller. Brent Bozell, the head of the Media Research Center, an organization that specializes in complaining about liberal media bias, claimed he was "in communication with Mark Zuckerberg at Facebook since he announced their new ‘fake news’ initiative." According to Bozell, Zuckerberg "assured" him that the initiative would not be biased against conservatives. Among the loudest critics of Facebook's initiative: The Weekly Standard. Mark Hemingway, a senior writer for the site, tweeted that the organizations selected by Facebook were "INCREDIBLY biased." The next day, Hemingway wrote a piece headlined "Asking PolitiFact to Police 'Fake News' on Facebook is a Terrible Idea." He described the Facebook program as "a panel of censors to police speech." He worried that, eventually, these "censors" would "police partisan disputes." According to Hemingway, the "entire media fact-checking enterprise is suspect" and exists to enable "reporters with no particular expertise to render pseudo-scientific judgments on statements from public figures that are obviously argumentative or otherwise unverifiable." "If you care about honest discourse, Mark Zuckerberg and Facebook need to hear the message loud and clear: You're not entitled to your own PolitiFacts," Hemingway wrote. In October 2017, Quartz reported that "Facebook plans to sign up a conservative US magazine, The Weekly Standard, as a fact-checking partner, according to several people briefed on talks between the two companies." According to Quartz's sources, the partnership was a response to right-wing criticisms of the initial program and an effort to "appease all sides." Facebook and The Weekly Standard had struck a deal, but there was a big barrier in the way. Facebook's program required The Weekly Standard to be certified by the "Poynter International Fact Checking Network" before it could be included in the program. The Weekly Standard's fact-checking program not certified — it didn't even have an active fact-checking program. Alexios Mantzarlis, the head of Poytner's International Fact-Checking Network, acknowledged via email that he was "informed by Facebook of their interest in partnering with The Weekly Standard Fact Check before they announced their partnership and before the organization had been verified." Mantzarlis said he told Facebook "that their interest wasn't a consideration that would factor into our process." The Poynter Institute receives funding from Facebook, although Mantzarlis stressed that Poytner's fact-checking program is not a direct recipient of funds from the company. Poynter certifies fact checkers by having publications submit an application and enlisting an outside expert to evaluate if the fact-checking program meets its standards. The Weekly Standard's application was evaluated by Mark Coddington, an Assistant Professor of Journalism & Mass Communications at Washington & Lee. I spoke to Coddington on Wednesday about The Weekly Standard's application and his report. Coddington told me that The Weekly Standard had applied for certification previously, in the Summer of 2017, but its application was not successful. Coddington also criticized the publication for allowing Mark Hemingway, the opinion writer who had blasted the announcement of Facebook's program, to author one of the fact checks. "We do not discuss applications that are not successful," Mantzarlis, the head of Poytner's International Fact-Checking Network, told me via email. The Weekly Standard had no dedicated fact-checking program before May 2017 and, after its application to Poynter was unsuccessful, appeared to shut down its program in June 2017. The Weekly Standard was interested in producing fact checks only if it allowed them to participate in Facebook's program. The controversy that prompted The Weekly Standard's application was not lost on Coddington. "I knew exactly why The Weekly Standard was suddenly developing a fact-checking unit," he said. At the time the Weekly Standard struck a deal with Facebook in October 2017, it had not produced a fact check in four months. The Weekly Standard resumed its fact-checking program on November 1, 2017. It hired one dedicated fact-checker, Holmes Lybrand, a 2016 graduate of the University of Texas at Austin whose previous journalistic experience consisted of four months at the Daily Caller. The Weekly Standard’s application was forwarded to Coddington on November 10, 2017, after only 9 days of fact checks by Lybrand. He had written 7 fact checks. By the time Coddington submitted his report on November 19, Lybrand had completed 10 fact checks. Coddington told me that he was advised by Mantzarlis to base his review, for the most part, on this recent work. In his report, Coddington said that the new fact checks by The Weekly Standard were somewhat improved. "[T]he current (i.e., November 2017) iteration of the Fact Check has been fairly even-handed, choosing claims from the conservative and liberal sides of issues and covering a variety of issues of broad public interest," Coddington wrote. He still was concerned, however, that "most liberally oriented claims have been found false." The bigger problem was that "the sample is too small at this point to determine whether the claims are being chosen in a fair way." I recommend several changes before the Fact Check is approved. Most broadly, the current version of the Fact Check has existed for only three weeks, and the IFCN calls for three months of consistent fact-checking before it is recognized as a distinct unit. The Fact Check needs to build up a larger sample of work in order to stabilize and be fully assessed in its current form. As Coddington notes, the Poynter program requires three months of consistent fact-checking and The Weekly Standard's program had existed for less than three weeks. Nevertheless, the Poynter board approved The Weekly Standard on December 6, 2017. The board overruled Coddington's recommendation and decided to treat the Weekly Standard as if it had an active fact-checking program since May 2017. The decision was made even though Coddington determined that the May-June fact-checking did not "comply with the network's principles." "The suggestion to wait for three months was waived by the Board in part because there had been a misunderstanding [in] our communications with the TWS… and in part, because the Board recognized very many edits had been made to reach compliance," Mantzarlis said. "The Board and I stand by Mark's assessment as well as by TWS Fact Check's verification." On the strength of 10 fact checks and a successful pressure campaign, the Weekly Standard is now empowered to reduce the reach of any article on Facebook dramatically. That's precisely what it's doing. This week The Weekly Standard deemed an article on ThinkProgress, a progressive publication, was "false," which largely ended its distribution on Facebook. The article argued that Brett Kavanaugh admitted in his hearing that he would overturn Roe v. Wade. It was a complex legal argument that I also covered in Popular Information. Kavanaugh said he would apply something called the Glucksberg test to Roe. Last year, Kavanaugh said explicitly that Roe would fail the Glucksberg test. The Weekly Standard did not even attempt to grapple with this legal argument. Instead, it deemed the article false because Kavanaugh did not explicitly "say" that he would overturn Roe. So now, fewer people are getting factual information about one of the most critical issues facing the country -- the nomination of Brett Kavanaugh -- because a right-wing outlet has decided they should not. Among those with concerns: Mark Coddington. "That is a heck of a lot of power for any organization to have, regardless of whether you agree with them ideologically or not," he said, commenting on The Weekly Standard's decision to flag the ThinkProgress article as fake news on Facebook. "Some of the problems that people saw coming happened." As Hurricane Florence approaches the East Coast, more than 1 million people have been ordered to evacuate. Florence is "a Category 4 storm with 140 mph maximum sustained winds that will also bring dangerous flooding and storm surges." The National Weather Service dubbed it the "storm of a lifetime." But as most residents seek refuge, prisoners in South Carolina will be left behind. "Right now, we’re not in the process of moving inmates. In the past, it’s been safer to leave them there," a spokesman for the South Carolina corrections department said. As ThinkProgress notes, the decision was made despite the proximity of several prisons to the coast. Ridgeland Correction Institution, for example, is located in the part of the state expect to be hit hardest. A limited number of prisoners in North Carolina and Virginia will be evacuated. The Trump administration's "zero tolerance" policy resulted in 2,500 children being separated from their parents. Even after a court order requiring all of them to be reunited by July, hundreds of children have still not rejoined their families. But, according to a new report in the New York Times, that story is just the tip of the iceberg. 12,800 immigrant children are now being detained by the federal government. That's up from 2,400 in May 2017. The surge is not due " to an influx of children entering the country, but a reduction in the number being released to live with families and other sponsors."